Valentine’s is one of thise holidays that I sometimes LOVE and sometimes skip over. Why? No idea. It’s definitely a craft worthy “holiday” though and that aspect, I will alway FULLY embrace! 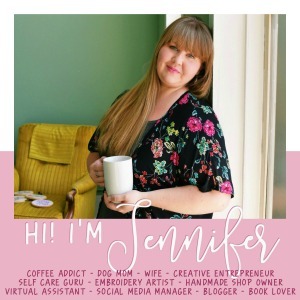 I’ve created and shared a number of Valentine’s Day themed projects, recipes and collections over the years, This year I thought I’d start off the season of lovey-dovy-ness with the best of Valentine’s on Busy Being Jennifer! Starring my favorite fur-babies, I made some puppy bandana’s for my girls a few years ago (Buffer was still a puppy!) and they’re so adorable! Gotta love a giftable valentine’s that is budget friendly and include a free printable! And what kid doesn’t like collecting and painting rocks? Holy Canoly! These are such a delicious treat! And there is a tasty cinnamon kick to these that is a BIG hit for both kids and adults! Pink and just a little bit girly, its a Perfect Valentines Wreath! PLUS it includes some fun crocheted flowers! Fun and EASY! 2 things that make these DIY Valentine gift ideas some of the BEST on the internet! This You’re the Balm Valentine is super cute, works for any type of lip balm you want to use, even homemade essential oil lip balm! These DIY Valentine “Bling” Soap Bars are ADORABLE, fun to make and are a cute giftable! I LOVE my Christmas Advent Calender each Holiday season, so for February, I thought it would be fun to share a Valentines Advent Calendar! These Tasty Valentines Day Treats are sure to make the day of love just a little sweeter, and definitely more delicious! I’ve got more Valentine’s goodness up my sleeves, so be sure to stay tuned for some more recipes, giftables and DIY’s that are perfect for Valentines! Wow! So many nice ideas! So glad you shared with us at Merry Monday. See ya next week!